How to Announce Your Wedding on the Web? Life, for every person, is full of various events. A wedding is often considered to be one of the most important ones. Sometimes people fail to express all their feelings regarding their wedding ceremony as words escape them. How you can you tell people about your upcoming wedding? In the Internet era, this problem can be solved by having a website. People search the web to find out multiple types of information. Why not launch a brilliant website that will inform people about your happy and romantic day? Just take a look of these WordPress website templates to get the most heart-warming website ever. Thanks to them, everyone can acquire real-time updates on your wedding. All of them have a noble and elegant look that will impress everyone’s imagination. Your Wedding… What a wonderful day that can be shared with your nearest people. This aesthetically-pleasing theme is made for inviting people to your splendid wedding. amazing social options not to keep silent about this event. Before inviting people to a wedding, you can tell them your romantic backstory. With this theme, it is possible to share a story of your meeting and proposal at their best. a wonderful search and contact form to give people the most pleasant user experience. Does your photo studio have something to do with wedding photography? This visually-attractive template allows creating the most sophisticated portfolios ever. unusual Google Fonts to highlight the most crucial texts. A top-notch template that makes it possible to create the wedding website of your dreams. It comes together with a wide range of options that allow sharing all necessary information about your wedding day. four blog layouts, seven header variations, and three footer styles. Without a doubt, a wedding is considered to be one of the most unforgettable days in life. If you want to assist people in making this event even more remarkable, show off your services using this theme. a great slider and banner to present the most interesting offers. 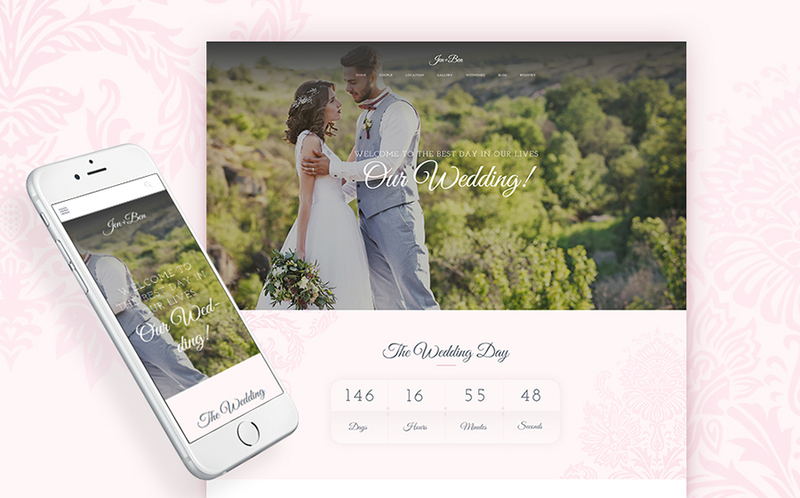 This sophisticated template will meet all your needs in terms of the perfect wedding website. Its design is carefully crafted in the palette of pastel colors that will make everyone adore your online-project. a great WordPress Live Customizer to edit colors and fonts. An extremely bright and remarkable theme that can be used for different beauty topics. As a result, you will get a feminine website that will distinguish itself from the crowd of others. the amazing Revolution Slider to present the most important information in the most visually-attractive way. In order to create a warm atmosphere on your website, you need something like this ready-made solution. It has elegant typography, aesthetically-pleasing background, and remarkable imagery. a few gallery types to present your images at their best. There is always more to speak about every wedding. A picture is worth a thousand words. In our case, a website is worth a thousand words. These beauty WordPress themes have all the tricks available to get the most visually attractive website ever. We wish for you to get a modern website that will invite all the possible attention to your wedding. Thanks for reading!